Why Buy A G-Wagon 6x6 When You Can Get This Six-Wheeled Jeep For Less? 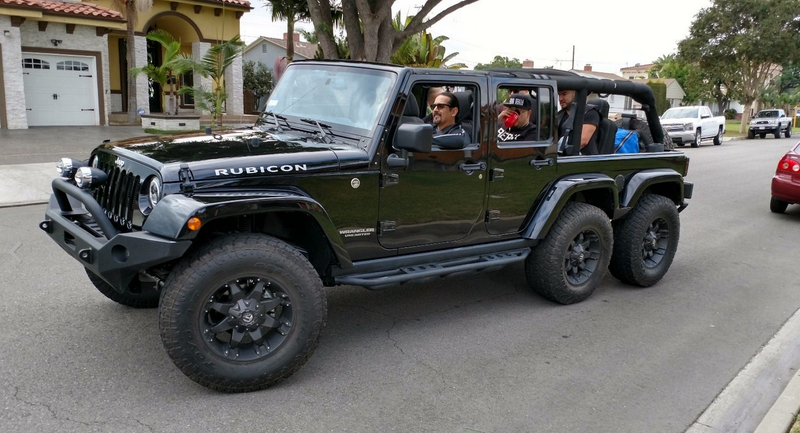 If you’re a bro with 86 grand to burn, and you often find yourself driving your tank-top wearing buddies—along with their kegs, Three Days Grace mixtapes and protein shakes— to get swole at the gym, here’s a six-wheel Jeep Wrangler that you can buy right now on Ebay. As a graduate of one of the frattiest schools on earth, the University of Virginia, I’m a bit of a connoisseur when it comes to bro-dozers. In fact, I even wrote an article on fratmobiles back when I was but a wee grasshopper of an intern here. I never thought I’d have to approach this subject again, but in my inbox this morning was a tip from a reader named Torrey showing images of what has to be the frattiest car in human history. It’s a six-wheeled 2016 Jeep Wrangler, and it checks all the boxes: it’s blacked out, has an aftermarket bumper, aftermarket lights, big rims, and a lift kit. The thing is as ostentatious as vehicles come, making it the optimal ride for a guy named Chad who just wants to chill with his dudes. In a lot of ways, the modified 2016 Wrangler is actually pretty cool, as it’s probably still relatively capable off-road (even with only the front four wheels getting power), and with the 3.5-foot stretch, it looks to seat seven comfortably. So if you weren’t able to snag a Mercedes G63 before they sold out, hop on eBay now and dish out some of that cash from your dad’s trust fund. Driving this Jeep will be epic.